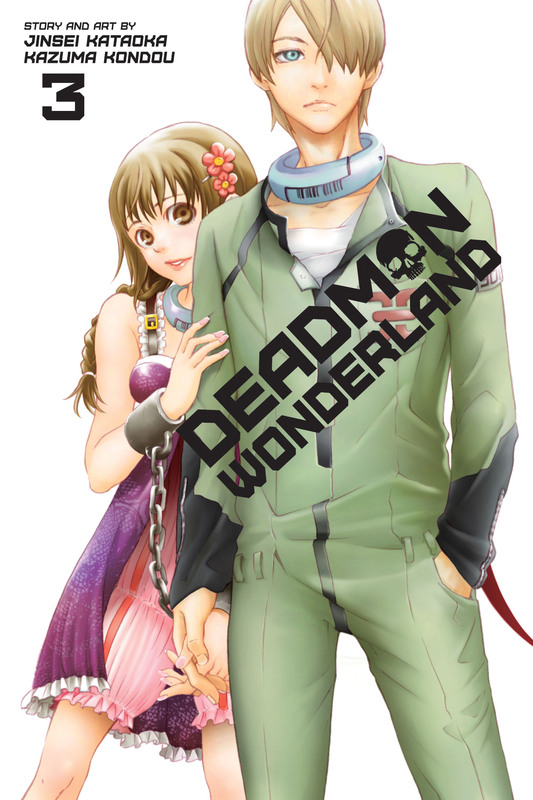 Deadman Wonderland volume 3 was written by Jinsei Kataoka and illustrated by Kazuma Kondou. This volume features the next four chapters (09-12) in the series, Read my review for the second volume here. In this volume, Ganta enters the Carnival Corpse for the second time but this time he is up against Minatsuki, a seemingly innocent young girl with a shy nature, this fight goes against everything Ganta stands for, however, he will need to learn to shake of his childish ways if he is going to survive what lies ahead of him. After this ordeal, Ganta is introduced to a secret group of deadmen planning a revolt against the prison. This Group, called Scar Chain, introduces Ganta to a new way of living in G ward, giving him hope of freedom, however, all of this is threatened when Azuma Genkaku, one of the prisons undertakers shows up on the scene. My Review: The series is really starting to pick up.This volume is so far the most depraved and violent of the series. All of the characters are starting to show their true colours and we start to learn a lot about the history between Ganta and Shero, as well as some history about some of the other characters. There is still quite a lot of mystery regarding the wretched egg which I’m really looking forward to reading. I quite like how with every fight Ganta is slowly learning how to use his Branch of Sin to is full extent. I not all too fond to this new introduction of the Uber Monk, he doesn’t really seem to add much other than just bring a new obstacle to overcome, but we shall see. Thanks a lot for sharing this with all people you actually realize what you’re speaking approximately! Bookmarked. Kindly additionally talk over with my website =). We will have a link change arrangement among us! You really make it seem so easy together with your presentation but I to find this matter to be really something which I feel I might never understand. It kind of feels too complicated and extremely huge for me. I’m having a look ahead to your subsequent publish, I’ll attempt to get the hold of it! Wow, amazing blog layout! How long have you been running a blog for? you make running a blog glance easy. The entire glance of your web site is wonderful, as well as the content!